The Moon looking north-west at 8:15 pm ACST in Adelaide on 4 August just before the Moon covers Saturn. Similar views will be seen elsewhere at the equivalent local time. See table below for exact local times. Click to embiggen. Telescopic view of the occultation. 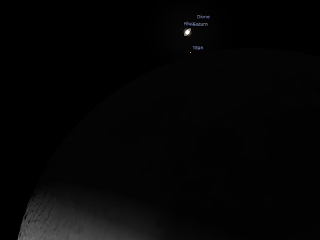 Saturns' giant moon Titan is just about to go behind the Moon at 8:30 pm ACST. Simulated in Stellarium. Click to embiggen. On the evening of Monday 4 August Saturn is occulted by the Moon as seen from the most of Australia (and all of New Zealand). This is the third and best of these rare occultations, it is under reasonable dark skies, with Saturn slipping behind the dark limb of the Last Quarter Moon. Saturn reappears while the Moon is still reasonably high. See here and here for images of the May 14 occulation. The Moon is a very obvious signpost where look and Saturn will be the brightest object near the Moon. Start watching about half an hour before hand to get set up and familiar with the sky, earlier if you need to set up at telescope and get it aligned properly. Although this event is easily seen with the unaided eye, it is best seen in a small telescope so you can see the ringed world in detail as it vanishes behind the Moon. Saturn's moon Titan will be occulted before Saturn, so you can see the Moon occult a moon. The occultation occurs in the early evening with the Moon will be reasonably high above the north west horizon, a good time to show the kids this event. The Moon easily visible and a ready signpost to Saturn. It is advisable to set up and practise on the Moon a day or so before the event, so you are familiar with your telescope set-up. Set up at least half an hour ahead of time so that you can be sure everything is working well and you can watch the entire event comfortably (trying to focus your telescope on Saturn moments before the occultation will cause a lot of unnecessary stress). 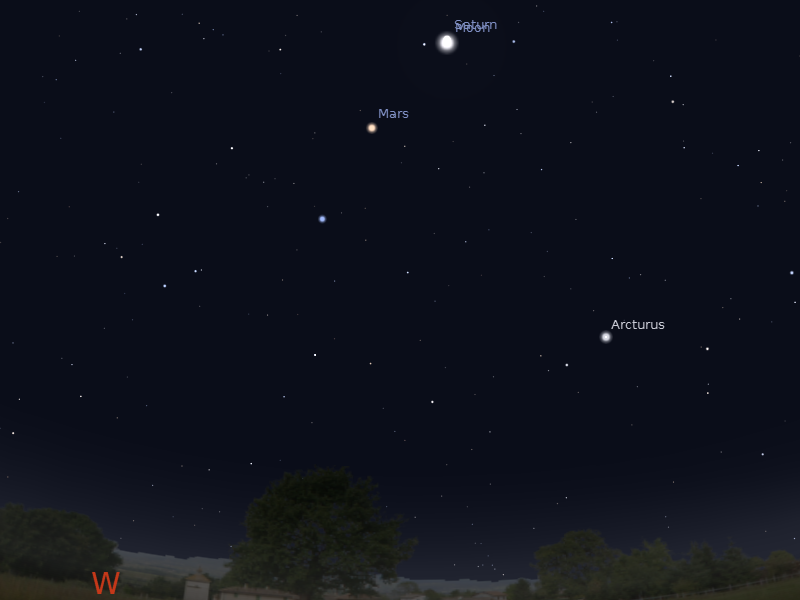 Saturn will be clearly visible in a telescope or binoculars near the Moon. This time the Moon is in its First Quarter phase, and it will be easier to see Saturn as the glare of the Moon will not be so intense. On the other hand picking up precisely when Saturn is about to reach the dark edge of the Moon will be harder. Timings for major cities are shown below, nearby towns will have similar timing. Who discovered the Southern Cross? Southern Skywatch July, 2014 edition is now out!